Welcome to Barkman & Smith Physical Therapy's patient resource about Impingement Syndrome. 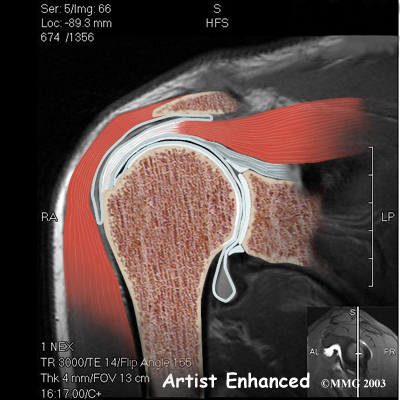 Impingement occurs to some degree in everyone's shoulder. Day-to-day activities that involve using the arm above shoulder level cause some impingement. Usually it doesn't lead to any prolonged pain. But having poor posture, continuously working with the arms raised overhead, repeated throwing activities, or other repetitive actions of the shoulder can cause impingement to become a problem. Impingement becomes a problem when it causes irritation or damage to the rotator cuff tendons. 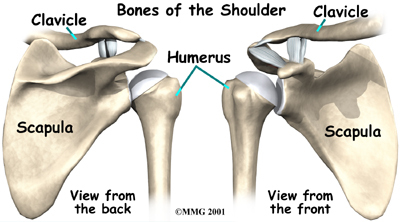 Raising the arm tends to force the humerus against the edge of the acromion. With overuse, this can cause irritation and swelling of the bursa. 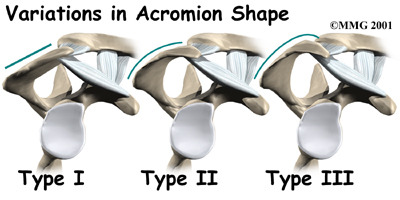 If any other condition decreases the amount of space between the acromion and the rotator cuff tendons, the impingement may get worse. For example, poor posture that involves an increased forward curve in the upper back (kyphosis) and rolling inward of the shoulders affects the alignment of the humerus under the acromion. 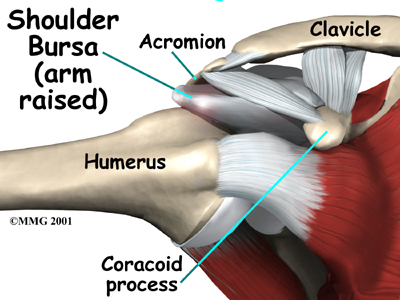 This alters the biomechanics of the shoulder (the ability of the shoulder to move freely and effeciently in space) which means even daily activity such as reaching increases the contact under the acromion. In some people, the space is too small because the acromion oddly sized. 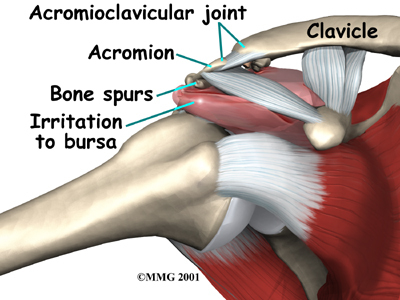 In these people, the acromion tilts too far down, reducing the space between it and the rotator cuff. 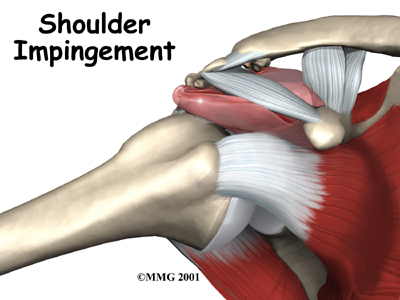 Impingement syndrome causes generalized shoulder aches in the condition's early stages. It also causes pain when raising the arm out to the side or in front of the body. Most patients complain that the pain makes it difficult for them to sleep, especially when they roll onto the affected shoulder. The diagnosis of bursitis or tendonitis caused by impingement is usually made on the basis of your medical history and physical examination. When you visit Barkman & Smith Physical Therapy our Physical Therapist will ask you detailed questions about your activities and your job, because impingement is frequently related to repeated overhead activities. Some patients may be referred to a doctor for further diagnosis. Once your diagnostic examination is complete, the Physical Therapists at Barkman & Smith Physical Therapy have treatment options that will help speed your recovery, so that you can more quickly return to your active lifestyle. Barkman & Smith Physical Therapy provides services for Physical Therapists in Bedford and Irving. Whenever possible, it is best to begin by trying nonsurgical treatment. You may be prescribed anti-inflammatory medications such as aspirin or ibuprofen. Resting the sore joint and putting ice on it can also ease pain and inflammation. Even if you don't require surgery, you may need to follow a program of rehabilitation exercises. When you begin your rehabilitation at Barkman & Smith Physical Therapy, our Physical Therapist can create an individualized program of strengthening and stretching for your shoulder and rotator cuff. At first, we will use various treatments to calm inflammation, including heat and ice. Our Physical Therapist will also use hands-on treatments and stretching to help restore full shoulder range of motion. Any problems with shoulder and upper back posture will need to be corrected first to improve alignment and shoulder biomechanics. Improving strength and coordination in the rotator cuff and shoulder blade muscles lets the humerus move in the socket without pinching the tendons or bursa under the acromion. Although time required for recovery varies, as a guideline, you may need Physical Therapy treatments for four to six weeks before you get full shoulder motion and function back. 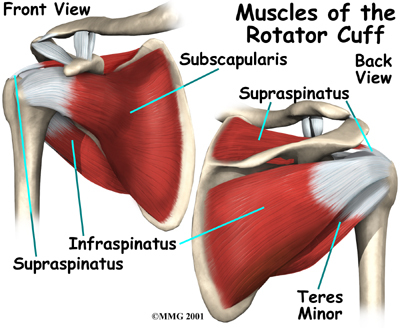 It is important to maintain the strength in the muscles of the rotator cuff. These muscles help control the stability of the shoulder joint. Strengthening these muscles can actually decrease the impingement of the acromion on the rotator cuff tendons and bursa. Our Physical Therapist can also evaluate your workstation or the way you use your body when you do your activities and suggest changes to avoid further problems. Rehabilitation after shoulder surgery can be a slow process. Although the time required for recovery is different for each patient, as a general rule, patients with impingement syndrome usually need to attend Physical Therapy sessions for several weeks, and should expect full recovery to take several months. Getting the shoulder moving as soon as possible is important. However, this must be balanced with the need to protect the healing muscles and tissues. You may be required to wear a sling to support and protect the shoulder for a few days after surgery. Our Physical Therapist may use ice and electrical stimulation treatments during your first few therapy sessions to help control pain and swelling from the surgery. We may also use massage and other types of hands-on treatments to ease muscle spasm and pain. Physical Therapy can progress quickly after a simple arthroscopic procedure. Your Barkman & Smith Physical Therapy treatments will start out with postural correction and range-of-motion exercises and gradually work into active stretching and strengthening. You just need to be careful to avoid doing too much, too quickly. Physical Therapy goes slower after open surgery in which the shoulder muscles have been cut. Our Physical Therapists will usually wait up to two weeks before starting range-of-motion exercises. Exercises begin with passive movements. During passive exercises, we will move your shoulder joint while your muscles stay relaxed. Our Physical Therapist gently moves your joint and gradually stretches your arm. We may also teach you how to do these passive exercises at home. Active Physical Therapy usually starts four to six weeks after surgery. We will have you use your own muscle power in active range-of-motion exercises. Our Physical Therapist may have you begin with postural correction and light isometric strengthening exercises. These exercises work the muscles without straining the healing tissues. At about six weeks you start doing more active strengthening. These exercises focus on improving the strength and control of the rotator cuff muscles and the muscles around the shoulder blade. Our Physical Therapist will help you retrain these muscles to keep the ball of the humerus in the socket. This helps your shoulder move smoothly during all your activities. Some of the exercises you'll do are designed get your shoulder working in ways that are similar to your work tasks and sport activities. Our Physical Therapist will help you find ways to do your tasks that don't put too much stress on your shoulder. Before your Physical Therapy sessions end, our Physical Therapist will teach you a number of ways to avoid future problems. Barkman & Smith Physical Therapy provides services for Physical Therapy in Bedford and Irving. If the pain doesn't go away, an injection of cortisone into the joint may help. Cortisone is a strong medication that decreases inflammation and reduces pain. Cortisone's effects are temporary, but it can give very effective relief for up to several months. 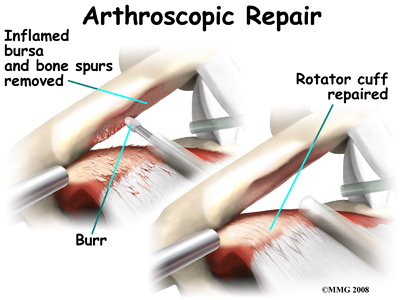 The most common procedure for AC joint osteoarthritis is resection arthroplasty. 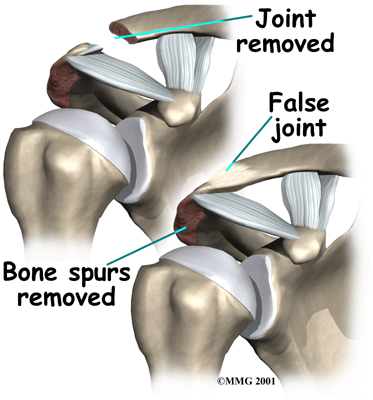 A resection arthroplasty involves removing a small portion of the end of the clavicle. 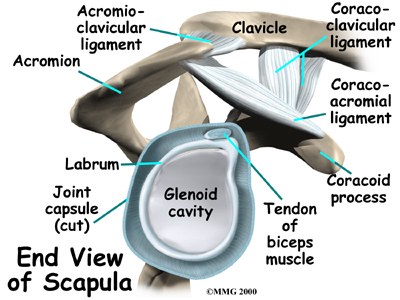 This leaves a space between the acromion (the piece of the scapula that meets your shoulder) and the cut end of the clavicle, where the joint used to be. Your surgeon will take care not to remove too much of the end of the clavicle to prevent any damage to the ligaments holding the joint together. Usually only a small portion is removed, less than one cm (about three-eighths of an inch). As your body heals, the joint is replaced by scar tissue. Remember, the AC joint doesn't move much, but it does need to be flexible. The scar tissue allows movement but stops the bone ends from rubbing together. 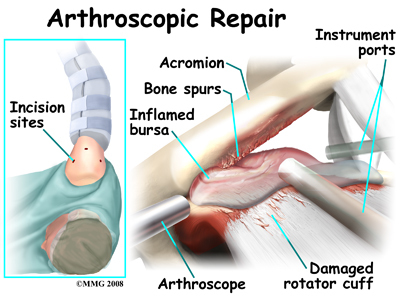 An arthroscope is a special type instrument designed to look into a joint, or other space, inside the body. The arthroscope itself is a slender metal tube smaller than a pencil. Inside the metal tube are special strands of glass called fiberoptics. These small strands of glass form a lens that allows one to look into the tube on one end and see what is on the other side - inside the space. This is similar to a microscope or telescope. In the early days of arthroscopy, the surgeon actually looked into one end of the tube. Today, the arthroscope is attached to a small TV camera. The surgeon can watch the TV screen while the arthroscope is moved around in the joint. Using the ability to see inside the joint, the surgeon can then place other instruments into the joint and perform surgery while watching what is happening on the TV screen.